An integrated condo development in Bedok Town Center by Capitaland, Bedok Residences, is drawing many buying interest following recent news in the media about Capitaland's plan to transform the Bedok Bus Interchange and the land adjoining. When completed in 2015, Bedok Residences will comprise of 8 blocks of 15 storey 583 apartment-units with condo facilities, doorstep access to Capitaland Shopping mall, a size that closely match Bishan Junction 8, and a seemless access to the Bus Interchange and Bedok MRT station. This integrated development will set the stage to transform Bedok Town into a vibrant hub In conjunction with HDB redevelopment plan to revitalise the town center. 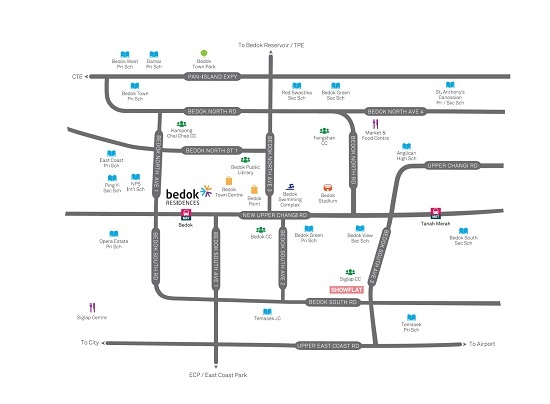 With all the conveniences - shopping mall, Bedok MRT and bus interchange - at doorstep, it hard not to get excited about Bedok Residences. Here's a quick glance at some of the benefits this development offers. Shopping convenience right at your doorstep! as CapitaMall retail is integrated into this development. This webpage is for information only. Whilst reasonable care has been exercised in preparing this information, it is subject to change and these particulars do not constitute, nor constitute part of, an offer or contract; interested parties should not rely on the statements or representations of fact but must satisfy themselves by inspection or otherwise as to the accuracy. No person in the employment of the agent or the agent’s principal has any authority to make any representations or warranties whatsoever in relation to these particulars and SingaporePropertyHunt cannot be held responsible for any liability whatsoever or for any loss howsoever arising from or in reliance upon the whole or any part of the contents of this webpage. S$7xxK own property in prime London! Selling Fast! 1 & 2 SOLDOUT. Now selling 3 +1 bedroom, S$4xxk Only! Discover KL's hidden property gems. Luxuriously furnished with Rental Guarantee. Property Talk this Sunday 2nd June. Register Now! CDL's latest luxurious condo, just 3mins from Buangkok MRT. Early bird discounts price from $6xxk. Book your unit before they are all gone!